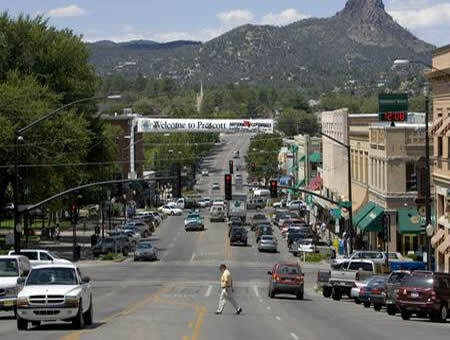 Whatever your lifestyle, it’s not difficult to find something to suit your needs in Prescott. There is a creative outlet for virtually everyone, whether you are into cowboy poetry readings and rodeos, Native American celebrations, exhibits of fine art, or little league. After sundown, Whiskey Row is the place to be! You’ll find many saloons, restaurants, and nightlife venues where you can eat, drink, and be merry. All of these amenities and attractions add to the locale’s undeniable appeal. But don’t take our word for it--come and check out Prescott area real estate for yourself! You will no doubt find your perfect niche here, in the heart of the Grand Canyon State. Smack-dab in the center of Arizona, where the vast Sonoran Desert gives way to higher elevations, majestic mountain ranges, and abundant stands of ponderosa pines, lies Prescott area real estate. This former cowboy hub is nestled within a valley at the base of the Bradshaw Mountains, surrounded by 1.25 million acres of lush forest, and to this day it still enjoys a distinct, Old West ambience. It also touts a moderate climate with mild temperatures – pleasant in the summers and just enough snow during the winter months. As such, the area has become a popular haven for enthusiastic home buyers in search of a unique locale. The homes for sale in Prescott are varied, with properties that cater to couples, families, retirees, horse owners, and even large-scale ranchers. 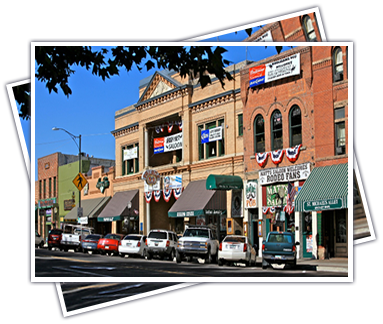 Although Prescott continues to grow and develop, the town still embodies its motto, “Everybody’s Hometown.” After all, it’s the rich culture and well-preserved territorial heritage that makes this place what it is: a quaint, charming enclave reminiscent of the Old Arizona Territory. Of course, modern amenities abound, mixed in with the old, historic structures that stand their ground. Homes for sale in Prescott AZ appeal to a diverse buyer pool and real estate includes everything from small, cozy abodes to sprawling mansions. And the locale definitely provides an exciting lifestyle, as there always seems to be something going on, no matter what time of the year.